Premium double shielded 5 BNC to 5 BNC RGB cables. This cable is made for carrying the highest quality RGBHV and all RGB type video signals for high end graphics workstations and RGB monitors with RGB inputs. 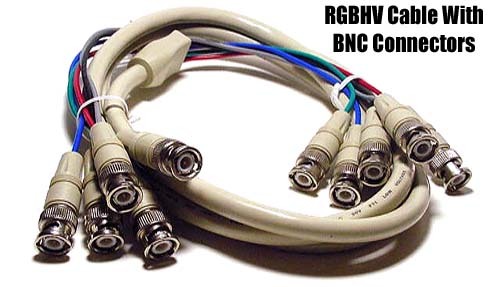 Five male BNC connectors in color code of red, green, blue, horizontal and vertical sync and terminated with 75 Ohm miniature coax. 5 color-coded BNC connectors for easy identification of red, green, blue, horizontal and vertical sync signals with internal coax lines. All-purpose RGB video cable for transmitting all RGB type signals. Supports YPbPr and YCbCr component RGB high resolution video standards for HDTV. Supports high RGB/RGBHV resolutions for graphic workstations, video monitors and projectors for RGB and RGBHV inputs.